I am obsessed with Pinterest. I have spent the last week or so poring over various "pins" and repinning them to my "boards." I have made three new recipes, and have bought materials to start on a couple of the craft projects I've pinned. If you don't know what Pinterest is, you are missing out! For those of you who have heard about it, but aren't sure what it is, I'll sum it up briefly. Basically, it's a visual "bookmark" site -- where you can see photos that represent recipes/photos/designs/saying/projects/idea from internet sites. You can also see and pin stand-alone photos if the item is self-explanatory. However, you usually want to be able to click on the "pinned photo" on your board and be taken to the referenced website -- which will give further instruction on how to make/do/buy the item in question. You can also search through Pinterest to browse other "pins" people have added, and even some items from the Pinterest team. When I initially received an invite to Pinterest, I didn't understand what it was, and frankly, I didn't have a lot of extra time to figure it out. So, I passed. However, after seeing several friends post about all the great ideas they were getting from the site, I decided I should check it out. New meal ideas aside, I really love being able to visually see a project/craft/clothing item that I like and be able to save it to buy/make/copy later. I've been so inspired that I have decided to create a challenge for myself. Spend half of our normal budget on Christmas gifts. How will I do that, you ask? Pinterest will help. They have such great ideas for making items to give for gifts -- as well as repurposing items into something else. And the last one is what I enjoy the most. I love taking something that is destined for Goodwill in its present form, and turning into something else that's completely gift-worthy. I won't detail my ideas here since my family stops by here from time to time, but they are going to be good! All it will require is time and and seeing through DIY glasses. 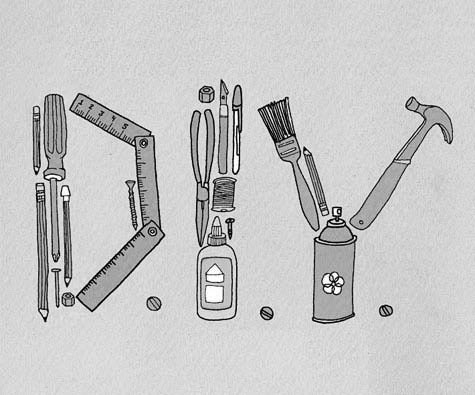 While Pinterest is a good place to start, I want to cultivate my DIY vision. I really want to get better about seeing things in my everyday life and seeing them as...well, something else. Take for instance a card embellishment I saw at our local craft store. It was so unique looking, but it didn't look like it belonged on top of a card. It looked like it belonged in my daughters' hair. So, I bought it and hot glue gunned it on an alligator clip. So basically, I made my girls a cute (and I would say pretty unique and fun) hair accessory for under $3. Normally, I would give you the link to the website where I found it. However, with Pinterest, I can suggest this to you, or you can find it yourself and pin to your own Board. That way, you'd never have to wonder again, "now where did I see that desk to side table conversion again?" I know that some people have the eye to see these potential metamorphoses than others. They are the artists in our life. They can look beyond what is or appears to be and see it from a different perspective. However, I think we can all cultivate that creativity with a little bit of time and effort. We can hone that skill to serve us well in our life -- so that we can both be frugalistas and also be kind to our planet by not continuing to buy new things, when perfectly good older things can be rehabbed. 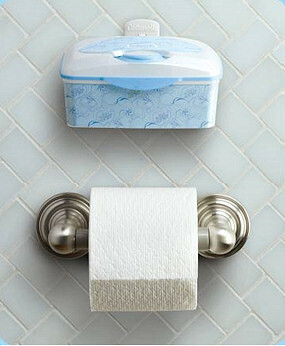 Take for instance these Cottonelle flushable wipes boxes. Somehow we have ended up with about six of these. We only need two (one in each bathroom). So what can I do with the remaining boxes? They are too nice to simply recycle. They have a nice re-closeable lid. Surely there is something I can do with them. 1. Use them to store art supplies like: markers, crayons, paint brushes, scissors, rulers and sharpeners. Then store them all in the same general place like a hutch. 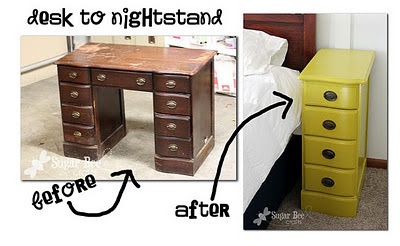 2.Turn them into a piggy bank by putting loose change or bills in it. 3. Store small toys like lego's or small cars and put them on a shelf. If you use something with a lid you can take them on the go easily. 4. These are perfect for hiding loose batteries and a perfect way to know exactly where they are. 5. Always find spare keys that you don't use everyday or ones that your not even sure what they're for. When you remember you'll know where to find it. 6. Keep misfit nails, nuts, bolts and screws in one place. Also have a way to easily transport them from room to room when you need them. 7. Spare cords and wire have a place to go now. If your office desk has some loose USB cords sitting around, just stick em' in one of the containers and store it at your desk. 8. Keep your make up organized instead of all over your vanity or bathroom counter. Decorate it and keep it right on the counter right at your fingertips. 9. Jewelry can fit nicely in a lot of these containers. 10. Gift wrapping supplies like tape, scissors, ribbon and cards can fit nicely in a small container. Then store it away somewhere with your other supplies. 11. Powdered laundry detergent goes nicely in a shoe box or container with a lid. I use this because I buy the bigger boxes of detergent and don't want the big box sitting on my shelf. A smaller box with a small supply on hand is easier to access. 12. You can store video game controllers, cords, battery pack or other accessories neatly in one place on a shelf or in a cabinet. 13. Cotton Balls and Q-tips fit neatly in the cottonelle wet wipe tubs. 14. Put misfit socks in a open container or box that sit in your laundry room. Then when the match comes along you'll know where to find the other. 16. Decoupage paper onto the top lid of the container and then use as a "gift box"
17. Spray with black spray paint for plastic and then decorate to make mini "pirate chests" for play or parties...or spray with a pastel color to make a princess treasure chest. I think this is a wonderful lesson in discipline (not spending unnecessary money) and great use of brainpower. It can also be a great way to include your family, and a wonderful chance to work alongside of your children. All it takes is putting on those DIY glasses. Who's with me?